From the Kamal Rahemoon till Faheem Farooq Abbasi all the revolutors did not curved their necks in front of dictators. In these, one of the most famous personality is Hemu Kalani. Hemu Kalani, born in Sukkur (Old Sukkur) 23 March 1923, his father's name was Pesumal, occupationally Contactor, and his mother's name was Jethi Bayi. His real name was "Raahi Heman", but every one called him as "Hemu Kalani". 1942, when the Mahtma Gandhi, issued last calls for independence from the british rule. He delivered an atractived speech, asked every indian to lay down their life. It was called Quite Indian Movment. Mahatma told "Do or Die"
In the same year, hemu kalani passed out the Matriculation (10 standard) exam with flying marks. He was really impressed by the revolution heroes who changed the history. And he wishes do something for his motherland just like his heroes. In the midnight of 23 October 1942, Hemu kalani and his friends came to know that a freight train is coming carrying bombs and weapons to resist the Indian Freedom Movements. This is why he and his friends planed to derail the train and destroy rail road so that train could not reach to its destination. At the midnight when they start pulling the sleepers and destroying the rail road, a police soldier saw them and chase them to capture. All his friends were succeed to escape except Hemu Kalani. 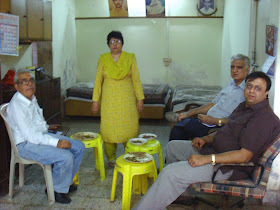 (here, I want to share another thing, Dr. Amir Abas Soomro wrote in his book name "Hind Ji Sindhin Ji Katha" [story of Indian Sindhies] stated once he met to (brother of Hemu Kalani) occpationaly building matrialist, during a long coversation with his brother he was shared us another thing that actualy when Hemu distroying the sleeprs, a biscuit factory was situated near by that rail road one of the gatekeeper of that factory capture him and gave him to the police). Police used third degree of torture on him and used maximum torture so that he can inform the names of his remaining friends. Government offers him if he inform the names of remaining friends Government can release him as soon as possible. But, 18 years old Hemu did not told names till last breath and he bear all the torture and pain. After continuous 22 days of torture, British government court martial to Hemu Kalani and sentences him as Whole Life sentence, but British government revised his punishment and judiciary convert his sentence to Death. Peerzada Abdul Sattar (Hemu's Lawyer) brings his uncle to signed by Hemu on the apology letter after that British government might release him. But Hemu did not agreed and said "I like to hang instead of apology against the Britain’s rulers, I didn’t do anything wrong that was right what I did".Hemu refused all the offers which offered by government. At the same night when Hemu hanged, his mother came to him and said him with tears "just write an apology letter and come back" even Hemu refused mother's appeal. Hemu, the young revoluter refuses all the offers by british rulers and he preferred to be hang. Hemu was happy in the jail, even his weight increased upto 7 pound it shown he was no afraid for his death. 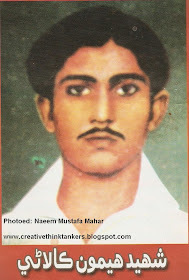 21 January 1943 Hemu hanged in Sukkur Jail (now a days, its know as Sukkur Central Jail 2). When authorities asked to Hemu what is your last wish befor death, he told them "Just before hanging say loudly with me HAIL FREEDOM" as his last wish no one did refuse and said very loudly "HAIL FREEDOM". Finally Hemu Kalani hanged. 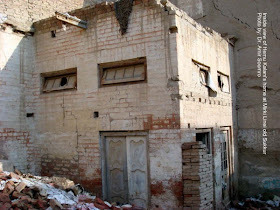 Another side, a big historical tragedy that after partition the mother of that patriot son who lost his life for his motherland, Jethi Bayi (Hemu's mother) left her country due to the religious violence and went to India. Indian government appreciate her because of her patriot son. 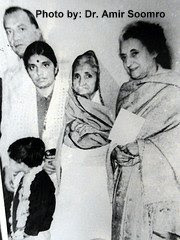 Nehru, and one of the General of Subhash Chander Boss gave her Civil Awards. While Indhra Gandhi releases memorable postal tickets in behalf of Hemu Kalani. 21 August 2003, BJP placed a statue of Hemu Kalani in the Dehli Parliament. In that ceremony Atal Bihari Vajpayi (Ex – P.M), L K Advani, Ram Jethmalani, Congress Leader Sonia Gandhi and other famous Indian political leaders were there. In memory of Hemu Kalani there is a memorable Building builded in Mumbai by Indian government, the land for this memorable building provided by government free of cost. Although, in 1981 in Sindhu Nagar (Ulhas Nagar), Mumbai a famous chowk named Venus chowk were renamed and gave it new name as "Hemu Kalani Chowk". On other hand, Hemu who lost his life for Sindh land, ignored by goverment and there is no any memorable place which belongs to Hemu’s name. In Sukkur there was a park named Hemu Kalani Park had renamed by Pakistani Government and gave it new name as "Qasim Park or Lucus Park". Now we can find Hemu only in the loud speeches of Nationalist Leaders and Sindhi poets. Nonetheless, there is no place for Hemu in his Motherland. Reference: "Inquilabi Vaat" [The Way of Revolution], January - Febuary 2009. You can also see the sindhi version of the above article by click here. Its amazing that Pakistan cannot recognize the fact that even if it is a islamic state,its people though muslims,are also sindhis,punjabis,pathans etc and importantly some of them could be non muslims.And a huge population that moved out of sindh still remembers sindh in every breath and has tears in their eyes when they remember their loss.Though Pakistan does not remember hemu kalani,its great to see NAEEM MUSTAFA MAHAR remember him.Its nice seeing one move above religious biases and remember a true son of sindh.i always wonder if the british had not hanged hemu would he have stayed on in sindh post 47 and would he have been a honoured figure in the new country? Thanks for giving such a worthy information regarding AMAR SHAHEED HEMU KALANI. Only one thing I want like to add, as per my knowledge, HEMU KALANI was born on 23rd March, 1923 not in 1924. Kindly check it. Dear DURGA DAS MOOLCHANDANI, Thanks you so much for updating me such positive information. I have updated above blog and wrote down the right date of birth of Amar Kalani. Thanks. The Great Hero of Sindh HEMU KALANI we didnt gorget you till today.